In this post we’ll see how we can create physics-enabled environments mixed with character animation for gaming using babylon.js and WebGL. In previous posts, I showed how we can use babylon.js to create 3D Maps using Bing and share 3D Scans from Kinect. But the heart of babylon.js is all about games, and here we’ll talk about aspects of interactive, physics-based 3D games using the framework. Skeletal animation is used to animate meshes based on bones – such as the walking character animation shown here. Babylon.js supports skeletal animation, and will accept animations exported from Blender. When creating the animation for this demo, I needed separate animations for walking, kicking, jumping and standing. What I chose to do was just append all of these separate animations into a single group of 90 frames, which you can see in the image here. One important note when exporting animations from Blender: we need to bake the location, rotation and scaling for the animation before export! To do this, select your mesh in Object Mode and then press Ctrl+A and choose Location. Repeat this for Rotation (and Scale if you have any key frames affecting scale). If you happen to try the demo on a touch-enabled device, you can use the left side of the screen to control a virtual joystick for movement, and the tapping anywhere on the right side of the screen makes the character kick. This is made possible by using the virtual joystick class from the GameFX library, which is included as babylon.virtualJoystick.js in the babylon source. 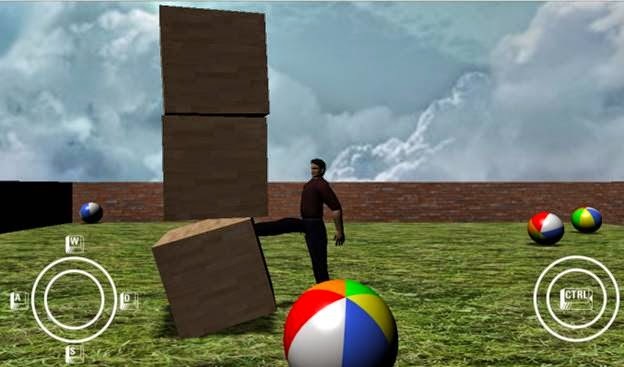 However, there are some advanced scenarios where a simple imposter will not do – for example, in the picture to the right you see our “dude” physics in the demo. Since we want our dude character to walk around and move/kick the physics objects around him, we need to have a more advanced imposter. 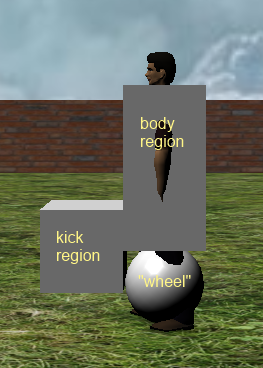 In this case, we can join a “wheel sphere” to a “body box” and then apply impulse to the wheel to move the box around. Additionally, the “kick region” is used to detect collisions with other physics objects when the character performs his kick move. To accomplish the character physics, three physics imposters are used. If you choose to use babylon.js for your next project, here are some resources that can get you started. Babylon.js samples and source – if there is one thing babylon provides, it’s a lot of cool samples. Poking around through this code is invaluable in learning the ropes. Babylon.js Wiki – full of some good tutorials to get started. Thanks for sharing this, Do you think its possible to upload the character model in .blender to make some tests. I'm sure I'm missing something obvious, but is the source available for download somewhere? What is the license for this demo? Very interested in source too. Where can I download it?